Walking through any of the Mayan ruins, it is easy to be look around in awe and wonder what these majestic cites must have looked like in their peak more than two thousand years ago. The Mayan empire covered an area from Southern Mexico to Northern Honduras. During its heyday from 250-900 AD, it was one of the most densely populated and sophisticated societies in the world. Among its many accomplishments, Maya have the first recorded use the concept of ‘zero’ in 36 BC, had a fully developed written language, used sophisticated mathematics and astronomy, and built many huge elaborate stepped pyramids and throughout the dense jungle. The Maya had no single center of power, but were a diverse group of powerful city-states that often were engaged in a struggle for power with their neighbors. There are hundreds of major Mayan sites and thousands of minor ones in existence today. We ended up visiting three sites in Mexico, and one in Guatemala over the last two months. Palenque (Palisade in spanish), the first site we visited was in southern Mexico, is set against beautiful jungle hillsides. We were awed by the pyramids crowned with temples, elaborate living quarters, aqueducts, and carved reliefs that covered the walls.The buildings that exist today are probably from a reconstruction effort after the invasion by the city of Calakmul in 599 and 611 AD. 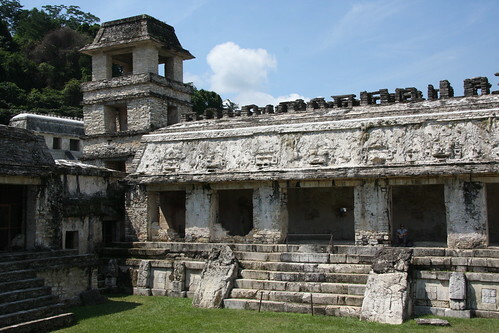 Close to Palenque is the very small but important site of Bonampak. In one of the temples, rainwater slowly leaked through the roof in a way that covered the walls with a thin layer of calcium carbonate. Unlike most Mayan sites, these magnificent murals are still visible. It is amazing to imagine that such murals would have covered many of the interior walls of the temples and royal living quarters. 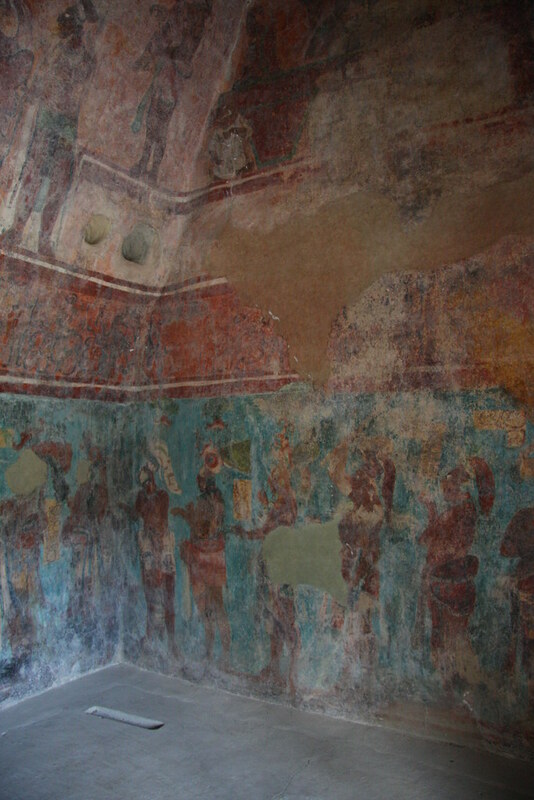 The discovery by archaeologists of these murals in 1946 (the local indigenous Lakandons led them there) changed the previously held notion that Mayan were a mostly peaceful society. We then went to Yaxchilan, a small site on the border between Guatemala and Mexico. With its maze of cavernous rooms and pyramids crowned with towering structures, this site is only accessible by a one hour boat ride from Frontera Corozal, the closest town. 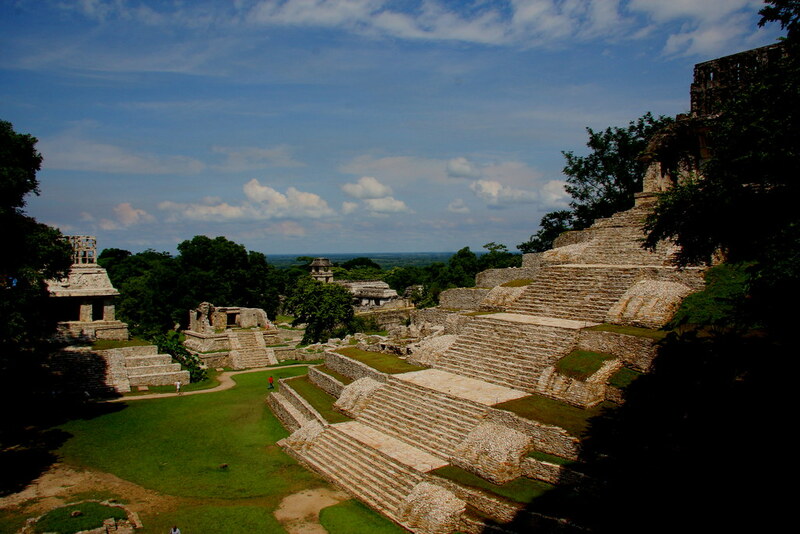 Yaxchilan was built on a river bend, but during a rainy period the river flooded and turned Yaxchilan into an island. 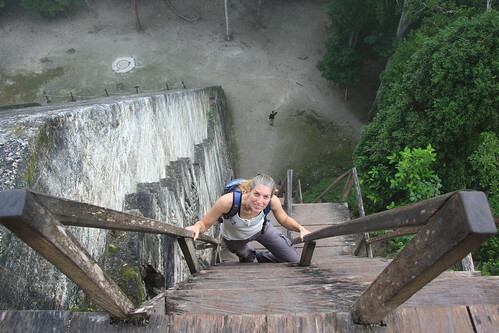 The Mayans solved this problem by building a 100 meter suspension bridge in the 7th century. The 63 meter span remained the longest in the world until the Italian Trezzo bridge surpassed it more than 700 years later. Finally at Tikal in Guatemala, we climbed one of the tallest pyramids of the Mayan Empire and looked across the jungle to see the tops of three other pyramids rising above the trees. These temples were the tallest of all the places we visited, and since people have died from falling down the steep stone staircases, rickety wooden staircases just as steep (but with handrails) have been installed. Around 1000 AD, the Mayan civilization rapidly declined from its height. The cause of this collapse is still subject to rigorous debate. Some people believe that a 200 year drought may have strained the dense population that had settled on land poorly suited to intensive farming, while others point to evidence of internal political strife. Today, over 6 million Mayan people live in southern Mexico and northern Central America today. Many Mayan still speak one of the 21-29 different Mayan languages, wear colorful traditional clothing, and practice a blend of Catholicism and pre-conquest Maya customs. 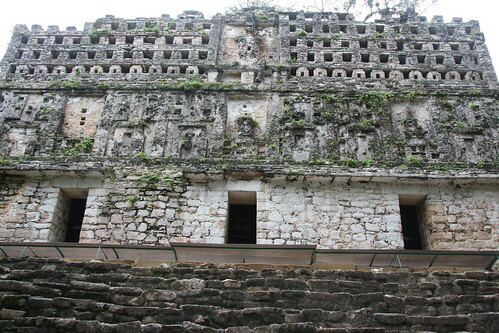 Many Mayans consider the ancient temples sacred. Ceremonies are still performed at Tikal, and in 2007, spiritual leaders performed a cleansing ceremony at the ruins of Iximche after US President George Bush's visit. When you visit a Mayan site, try to ignore the grass lawns (a European invention) and the vendors selling inaccurate Mayan reproductions. Imagine seeing priests instead of tourists on the top of the temples, and instead of seeing the jagged exposed bricks, imagine the temples beautifully painted and covered smooth with limestone stucco. And, if you are a person well known for your unpopular foreign polices, expect a spiritual cleansing ceremony to be performed in your honor.